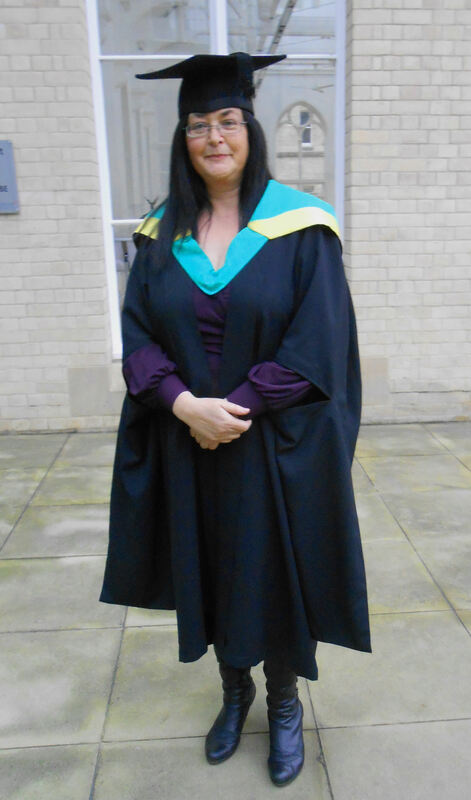 I'm Kaye Bewley and this is a photograph of me on my graduation day at Nottingham Trent University, looking very studious, I know. Below, I've listed the qualifications I have gained in order of me to assure you of my competence to practice. Briefly though, I earned my Masters (Hons) degree in psychotherapy as a mature student, I have presented workshops and have written several psychotherapeutic books, as well as helped to promote other therapists through my newsletter, publications and websites. To ensure I keep up-to-date with my professional development and training, I am a member of the British Psychological Society (BPS) and continually attend new educational courses. Kaye Bewley gained experience in the media, marketing and military environments. She took a career change into the psychology field, after many years of being consulted or turned to for advice, she took formal education and attended Nottingham Trent University to earn her MA in Psychotherapy. After securing her educational goals, she set-up her own therapeutic practice and began to assist people professionally. She now assists soldiers and accident victims experiencing traumatic stress (PTSD), those who suffer with depression and anxiety issues and also helps writers build their confidence enough to get published. 3. Slippery Frog or Faithful Dog - which do you wanna kiss? The Cognitive Behavioural Therapy (CBT) techniques are backed by thousands of research papers proving its evidence-based effectiveness. The therapy is a structured form of psychotherapy that assists in changing unhelpful thinking and behaviour during times of distress. It is fully compatible medication if you use this. National Institute for Clinical Excellence (NICE) gives an overview which supports its effectiveness, while the Royal College of Psychiatrists gives a summary. With a remit to provide specialist teaching and training tailored for Oxford Cognitive Therapy Centre OCTC comes under the remit of Oxford Health NHS Trust while working alongside Oxford University. Kaye is an Affiliate member of the British Psychological Society (BPS) which is the representative body for psychology and psychologists in the UK. The BPS are responsible for the development, promotion and application of psychology for the public good. The BPS enhances the efficiency and usefulness of psychologists by setting high standards of professional education and knowledge. DBS Enhanced cleared to work with vulnerable young adults. Copyright 2016 © BewleyTherapy.com. All Rights Rights Reserved.